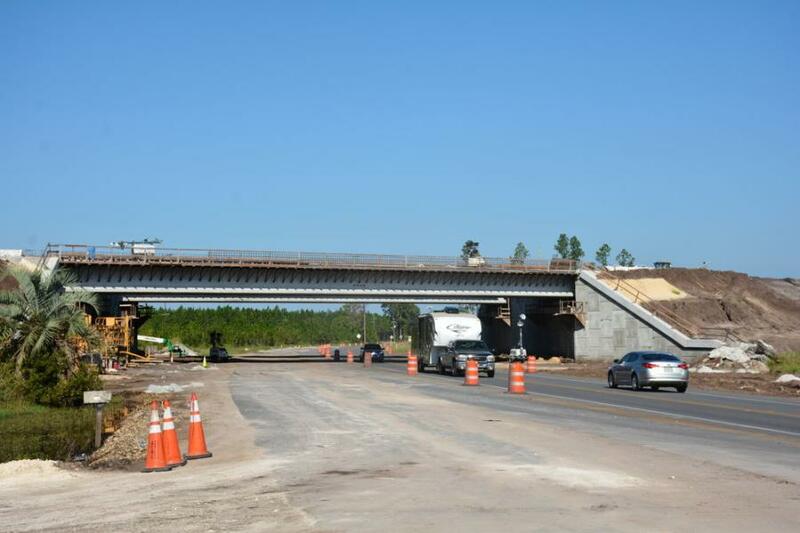 Work includes construction of bridges over County Road 100A and County Road 229. As truck traffic continues to increase in the U.S. 301 corridor in Starke, Bradford County, Fla., the Florida Department of Transportation (FDOT) is spending $90 million to construct the 7.3-mi. Starke Alternate Truck Route, also known as the Starke 223 Bypass, to relieve traffic congestion both now and in the future. Two contracts for the project, which will ultimately create two lanes in each direction separated by a grass median, were awarded to the Anderson Columbia Co. Inc. and Superior Construction Company. The contractors began work in August and October 2016, respectively, and are expected to finish by late summer or early fall 2019. The work also includes the building of bridges over County Road 100A and County Road 229. The CR 100A bridge will extend 412 ft. on the northbound side and 435 ft. on the southbound side, which also serves as an overpass for the CSX mainline track. The CR 229 bridge will be 120 ft. long, with two lanes in each direction. The work zone is located between County Road 227 and County Road 233 on the west side of Starke between the downtown core and residential areas and lakes. Two interchanges, including bridges over State Road 100 and State Road 16, are being constructed along the new roadway to provide access. FDOT anticipates that the new route will carry 25,000 vehicles per day, which will increase to 31,000 per day by 2040. "The new roadway will provide an alternate route for freight-carrying trucks and will help alleviate some of the traffic congestion on U.S. 301 through downtown Starke," states the project web page. "In addition to relieving congestion on the busy U.S. 301 corridor, it is expected to provide additional capacity for future traffic growth." Troy Roberts, an FDOT communications specialist, District 2, Northeast Florida, noted that planning for the project began in 1993. "Congestion in Starke is a pretty serious matter," he said. "This is a solution that we've been working toward since the early '90s when FDOT and the city of Starke and Bradford County began discussions on a way to alleviate traffic congestion. Currently, we see approximately 30,000 vehicles a day on U.S. 301, a significant amount of traffic for a city the size of Starke. And even more impressive when you realize that there are areas of Interstate 10 north of Starke that only see daily traffic counts of around 22,000." The decision on the final route was not taken until 2014, and the project took years of coordination and public outreach with various stakeholders. "Determining the best possible solution to reduce congestion on the U.S. 30 corridor in Starke was a huge hurdle and was something FDOT did not take lightly," said Roberts. "To move forward, the department had to have local support for the project. This project would entail a huge amount of change for a rural town and FDOT made sure to move forward cautiously so that the best possible solution was chosen. "I think everyone knew we needed this project to help with congestion, but the question was, do we try and go through town, do we go around town?" he added. "There were years of public meetings with the city, the county, and the citizens of Starke and Bradford County where we went back and forth on the design plans before we eventually came to an agreement that this was our best option." Since there were no mitigation banks available, a method of mitigating the impact of construction on 81 acres of wetland had to be devised. FDOT worked with the Suwannee River Water Management District (SRWMD) to develop an innovative solution to utilize a design-build option. "This option allowed numerous potential private partners the ability to develop a plan to provide mitigation for the project," said Roberts. "This in turn allowed the Department and the SRWMD to mitigate for the project and ensure that the most practical solution was chosen and at the best possible value for taxpayers." The road and bridges were designed by DRMP, Parsons Transportation Group, Wantman Group and H.W. 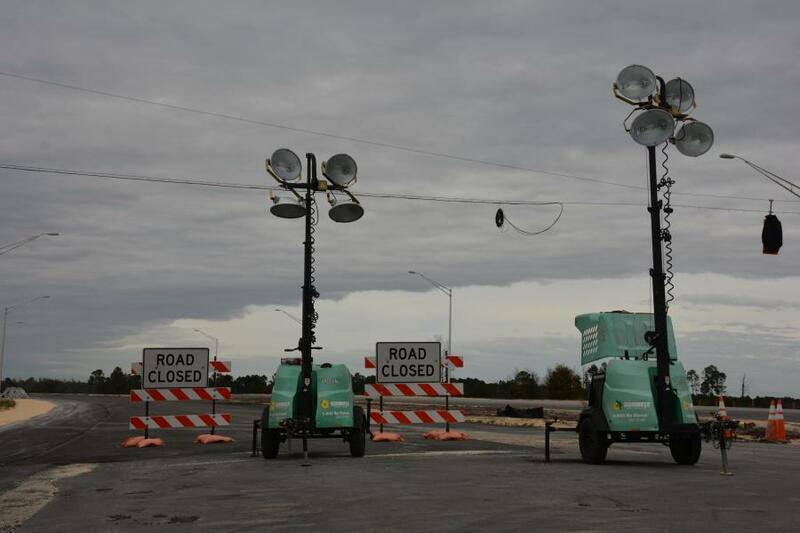 Lochner, Inc.
With most of the construction taking place west of Starke, FDOT has worked to limit traffic impacts on U.S. 301. "We know any construction project can be difficult for motorists and we've done our best to mitigate any impacts this job may have on the local residents and those just traveling through," Roberts said. "Our trucks, of course, use U.S. 301 to move materials to the job site, but aside from the occasional lane and road closures at the new interchanges and bridges — which we try to limit strictly to night work — we've done our best to be very mindful of our work and how it may affect travel." 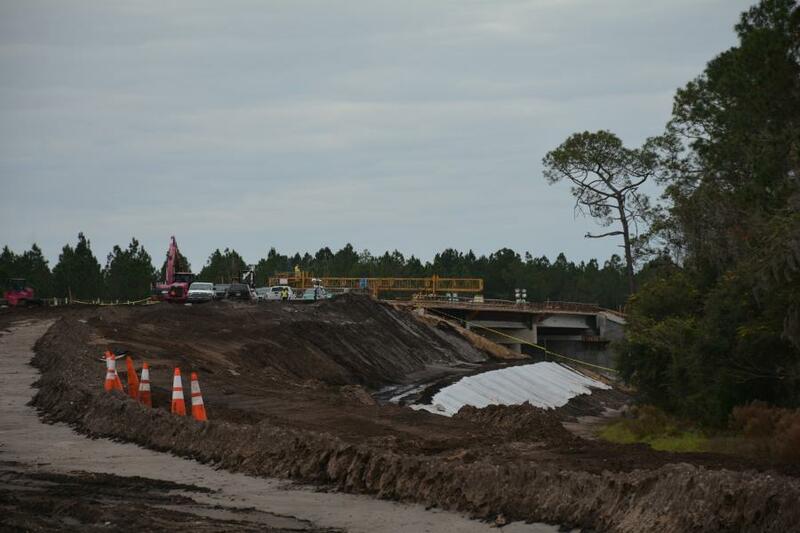 Construction crews have completed the following elements: four new bridges spanning both Alligator Creek and SR 100, an MSE wall, pond excavation, subsoil excavation and removal, fill import, box culvert construction, drill shafts, and the Route 301 traffic shift. Benchmarks for construction in 2019 include completion of the final bridge spanning the CSX railroad. "This project requires over 1 million cubic yards of imported fill for the southern half of the bypass," said Tony Smith, Superior's project manager. "Acquiring the material and equipment to move this much earth has been a challenge, but maintaining frequent communication with those involved has made this process easier." "Wet conditions have been a major issue throughout," said Daniel Jerrels, Anderson's senior superintendent for roadway and drainage. "We have overcome this challenge by being flexible with means and methods, and being able to adapt to work at multiple locations to accomplish work tasks." Crews are able to work day and night shifts, but major night operations have not been required so far. "Sufficient time was provided for planning," said Jerrels, "and we had a plan to attack the north end of the project to help alleviate hauling and access concerns further along during the project. Crews are working in multipole locations." Smith noted that most of the Superior crews on site have been solely dedicated to the bypass. Concerning utilities, Smith pointed out that the general contractors have been in close communication with many companies during the relocation process. "Utilities installed, including overhead lighting, are about 80 percent complete," said Billy Jennings, Anderson's project manager. "All relocation of utilities has been completed to date, consisting mostly of overhead power lines." The project is being carried out on a green field, which provides sufficient space to store materials and set up laydown areas. "One of the keys to our success has been the involvement and hands-on approach of owner Doug Anderson, who is available for support and has made resources available as needed to push the project forward," said Jerrels. "We anticipated wet conditions hampering operations and were able to be flexible in day-to-day operations. All issues on this project have been handled in a timely manner, with the majority resolved at the field level with the CEI (HNTB), making the response time even quicker. The overall working relationship on this project has been great." Smith agreed on the team work aspect. "Our relationship with both FDOT and the CEI, WSP USA and Lochner on this project has helped it move along efficiently with minimal issues and quick responses," he said. "We constructed a concrete wall in place of a portion of the sand cement riprap located at the southernmost bridge. It helped reinforce the area it was placed and cut down on time for installation." Anderson Columbia submitted and had approved three cost-savings initiatives on the project. 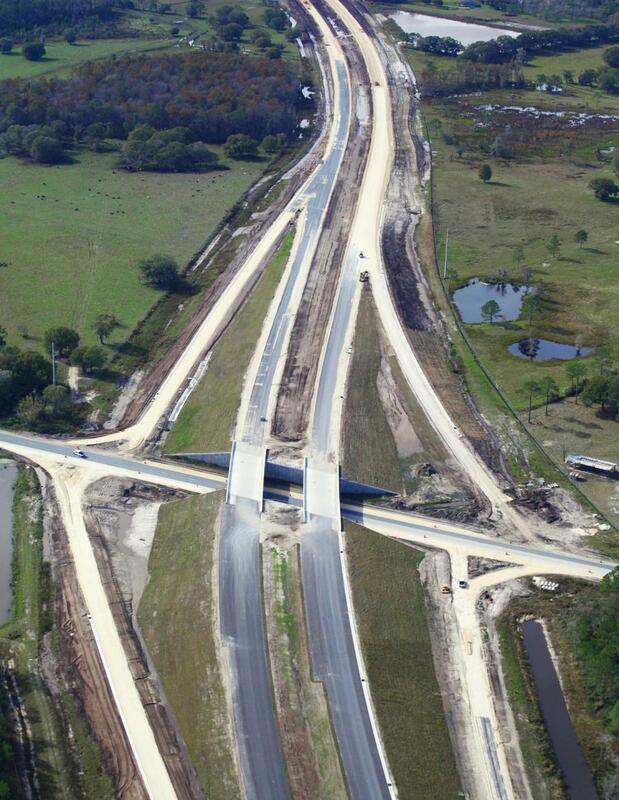 "It contributed to significant savings to FDOT and the taxpayers," said Jennings. With the route mapped out, the plan of attack had the roadwork start at multiple locations, starting with earthwork and site prep. "It took about eight months of clearing, earthwork and site prep before we placed our first section of base on the CR 100A realignment," said Smith. "Total time spent placing embankment was just shy of two years. It had its challenges but overall was a smooth operation — many of our graders and dozers contain GPS systems." Rainfall was one of our biggest obstacles during the year. "It took approximately one year of clearing and grubbing, embankment placement and box culvert construction to allow for the first base material to be placed on the project," said Paul Raulerson, Anderson's senior superintendent structures and excavations. "We utilized GPS on bulldozers, graders and backhoes for placement of embankment, base and pond excavation. There was an abundance of unsuitable material coming out of the ponds. This material was able to be used outside the 2:1 slopes, eliminating the need to haul it off site." "We were able to use the fill from all four ponds on site for the slopes and roadway," said Smith. The roadwork had crews start at both the north and south ends, with both sides of the highway being built simultaneously. "Finding A-3 material for MSE walls is a bit of a challenge," said Smith, "but we were able to find great material through our network of builders. We have three SCC crews on roadway, two large crews for embankment, and one crew for road base." "Ingress and egress to the site due to weight restricted routes was an issue," said Raulerson. "We have had to carefully plan work activities to ensure we didn't box ourselves in." "We used two grade crews and two embankment crews," said Jerrels. "At the high point of hauling embankment, we were able to haul and place 10,000 cubic yards of fill on a good day early in the project." The bridge construction is progressing with few setbacks. "Thankfully we are close to finishing bridge work for this project," said Smith. "However, our plan of attack was to finish pile driving for all bridges and then take it one bridge at a time. We started with the bridges over Alligator Creek to allow permanent access over the creek. This allowed a safer haul route for our fill trucks and other deliveries. Next, we completed the bridges over SR 100 since they were single span bridges and simpler to build. That gave us the ability to focus all our energy and resources on the bridges over the railroad to finish out in a safe and timely fashion." Building a structure above a mainline rail tracks is never easy. "Progress continues with no major setbacks," said Smith. "Every day, we have a morning briefing with the railroad flagman, our onsite SCC safety director, project management, and all employees working near the railroad. Every week we update CSX with our two-week schedule and remain in close contact for any changes. We limit the amount of people working directly over the tracks, and we have toe boards to protect the tracks from overhead work and lanyards attached to small tools. This not only protects the railroad below, but also any employees that may be working below." There are nearly 30 construction workers on site, including those from subcontractors such as Whitehurst for asphalt paving and limerock import, Suwannee Valley Grassing for performance turf, All Out Fence for fencing, Bonn J for MSE wall, Hinson for lighting and signals, Powercore for overhead sign structures, Capps Land Management for drainage, Gosalia for concrete flatwork, CPI for flat work and barrier wall, Leware for bridges, Central Florida Trucking for base material delivery, ABC Stumping for mowing and litter removal, DNS for flatwork, Long Fencing for fencing, Roberts Land and Timber for clearing and pond excavation, and RWH for MSE walls. Anderson is paving the north portion of the project as the prime. "We communicate two-week look-ahead schedules and keep each other updated with any changes via email and phone calls," said Smith. "We have working relationships with all our subcontractors and use many of the same ones on other projects." "Our superintendents and project manager coordinate schedules through daily phone calls, emails, and onsite meetings," said Jennings, who has about 45 workers, which includes subcontractors and truck drivers. Superior is using 5,200 cu. yds. of concrete, 64,000 tons of asphalt, and 550 tons of steel, while Anderson Columbia is using 4,000 cu. yds. of concrete, 78,000 tons of asphalt, and 484 tons of steel. There were also 1.6 million cu. yds. of embankment for one end of the truck route. A wide variety of equipment is being employed, with Superior using a Manitowoc 888, a Kobelco CK1600G and an RT 765E picker crane; Cat 349, John Deere 350G, and Kobelco SK500 excavators; John Deere 650s and multiple Komatsu D51PX22s dozers; Volvo L110, L90, and L70 loaders; and Cat CS54B, Bomag BW211 and D-50 and Hamm H11IX rollers. "With a project this long, there are a wide variety of wear-and-tear items that need work to keep things operating at their full potential," Smith said. "Daily maintenance is completed by the operators, and we send someone out from our shop for the major repairs. Great communication to ensure the correct pieces are being repaired is the key to good maintenance." Superior rents equipment from Ringpower, United Rentals, Sunbelt and Herc Rentals, and leases equipment through John Deere. "They help with onsite maintenance and delivering equipment to us quickly," said Smith, noting that consistent communication and quick response times are crucial to good general contractor-dealership relation. 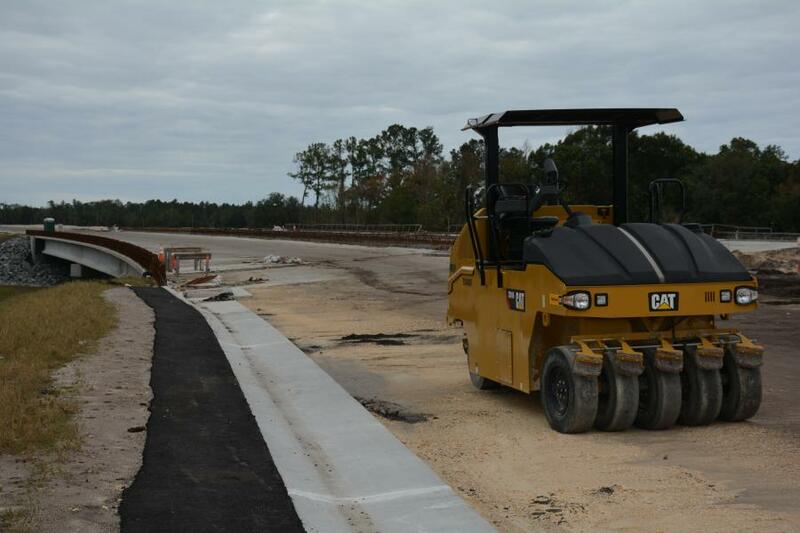 Anderson Columbia is using Cat D6N dozers with grade control, Cat 349F and 336F L excavators, multiple 350 ZX350 Hitachi excavators, single-drum rollers, multiple A30G Volvo off-road trucks, multiple Cat CS56B single-drum rollers, Cat 140K and 12H graders, a Cat 12H grader, a Cat 613C scraper, Cat 938 G loaders, a John Deere 8245R tractor with 14-ft. pull-type scraper-roller, a Cat AP1000F paver and Cat CB54XW asphalt rollers, along with various other Cat and Komatsu pieces. "We utilized Travis bottom dump trailers with Peterbilt and Mack trucks to haul embankment on site, which allowed us to haul more material per load allowing us to increase production," said Jerrels. "The off-road use of our trucks intended for use on the highway has greatly affected the longevity of the life of the trucks. We have onsite mechanics. Our key to success is having a good preventative maintenance program that assists with day-to-day maintenance." Anderson Columbia purchases equipment from dealerships such as Nextran and Ring Power in Lake City. "They help with onsite training and maintenance," said Jennings, who stressed that good communications leads "to good response time to deal with issues." Jerrols said he is pleased with the morale of the crews. "Many of our employees have been here from the get-go," he said. "We enjoy coming to work and are close to seeing the final product come to realization. With various stages of work, employees have been able to learn multiple items of work. From earth work to pipe and concrete operations, we have been able to cross train some employees during the length of the job as we move from phase to phase. "Morale stays positive due to the good working relationship between employees, subcontractors and CEI," he continued. "Many workers have been here from the start and have worked their way up in various tasks."